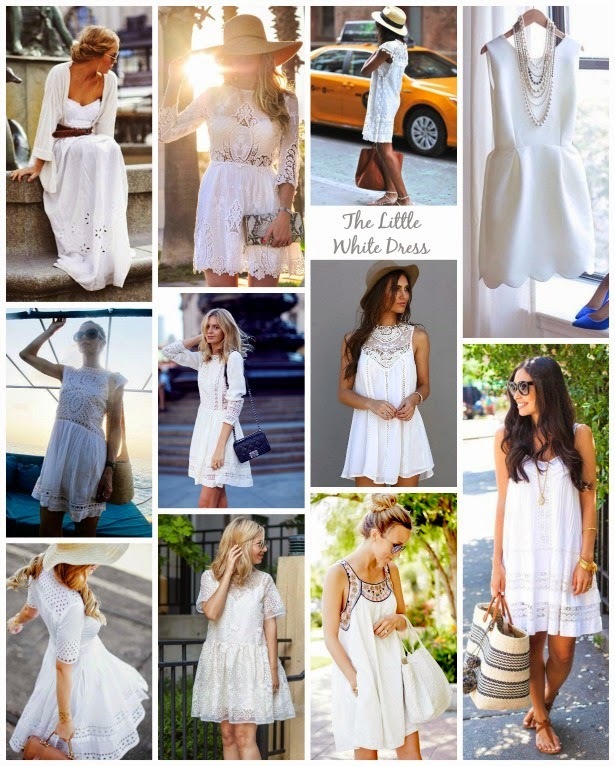 While the Little Black Dress (LBD) rules as the key item in any woman's dress collection, once the summer arrives most fashionista's trade it in for the Little White Dress (LWD). Lightweight and perfect for the warmer weather, a LWD in lace, cheesecloth or cotton is a great and stylish way to stay cool. Some prefer a simple clean dress others a touch of delicate lace detailing or some boho embroidery - whichever you love teamed with sandals, sunnies and a oversized tote, your all set for the sun. The highstreet in particular have really embraced this piece and there are so many versions available, whatever your budget or preference - sleeves or sleeveless, short or midi, loose or fitted - which would you choose? Up until last year I was a little dubious about donning a LWD, mainly because of its pale colour and my nack of dropping things, something you obviously don't want to do in a white dress. That was until I found a gorgeous double layer dress with lace detailing from Dorothy Perkins, this dress made me feel brave and looks amazing with tanned pins (and touch wood so far no spillages). A staple piece in my summer wardrobe and appropriate for the office when layered with my favourite longline floral blazer.